The Delta - v135n1 - 68th Grand Chapter - Sigma Nu Fraternity, Inc. 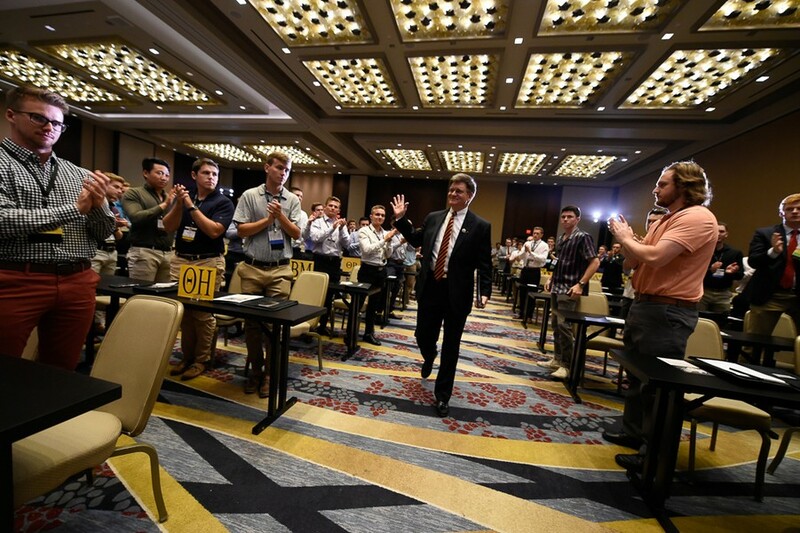 Being a collegiate delegate at the 68th Grand Chapter of Sigma Nu in Washington D.C. provided many once-in-a-lifetime opportunities for me and hundreds of other Sigma Nu brothers from around the country. We stayed in a gorgeous hotel, explored the city’s many restaurants, retailers and monuments, walked the same grounds as our nation’s politicians, and marveled over the Fourth of July fireworks exploding in night sky over Capitol Hill. While all of this was very fulfilling and memorable, they are not the reason this trip was so meaningful to me. After I landed in D.C., checked into the hotel, and attended the first business meeting, I was exhausted. 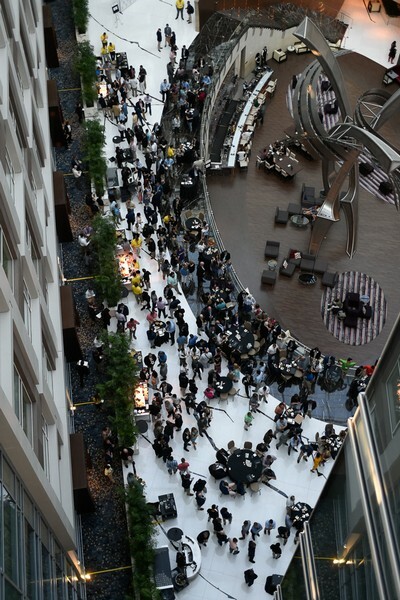 There was still a welcome reception taking place that night in the hotel’s foyer and full days of business in the days ahead. I really wanted to just get to bed early, but something told me to go down to the reception. Once I was down there, a video presentation on the history of Sigma Nu, put together by Grand Historian Bob McCully (San Diego State), was being played. The themes of our nation’s founding in 1776 mirrored very similar to our founding shown in the video. A handful of young men sought out change in the institutions they had been a part of and stood for what was right rather than what was tradition. Attendees gather in the atrium for the premiere of a documentary on Sigma Nu's 150-year history. Change isn’t always easy, but Grand Chapter was the perfect place to develop, debate, and vote on changes for our fraternity. Among these new changes included an “Inclusivity and Diversity Resolution” that upholds Sigma Nu’s core values. This resolution was backed by legislation that made The Ritual more accessible for brothers with auditory and visual impairments. 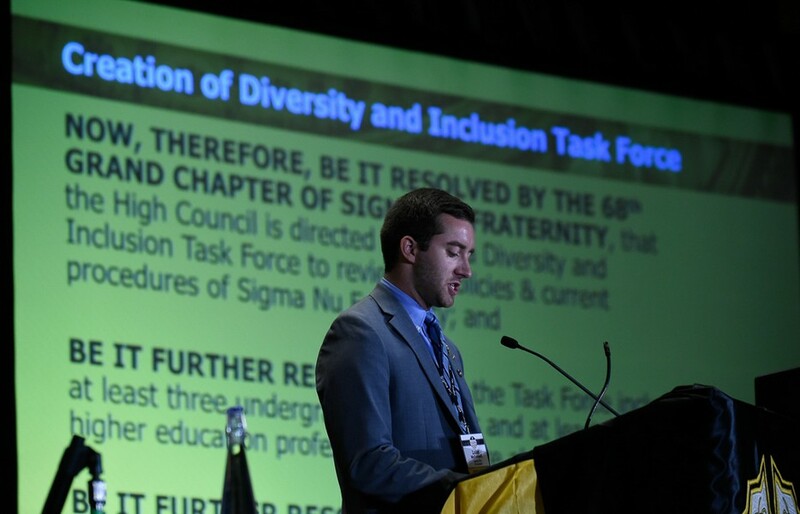 Luke McConnell (Tennessee), a collegiate member of the Resolutions Committee, reads the Diversity and Inclusion Task Force resolution during the Resolutions Committee's report. The Fraternity also experienced a change in leadership among the High Council. John Hearn (Georgia) will assume the role of Regent. Tim Huffmyer (Michigan State) was voted as the next Regent-Elect. Al Wurster (Purdue) received a unanimous vote for Grand Treasurer and David Mainella (Bradley), Maury Gaston (Auburn), Steve Ratternman (Indiana), and Jason Lyons (Thomas Jefferson) were voted to Vice-Regent positions. Although the High Council of the last biennium set a high standard, I think the men elected can protect and advance our Fraternity’s great legacy for many years to come. Elections Committee Chairman Rick Tate (North Carolina State) explains the procedures for the election of a new High Council. With changes made at the national level of the Fraternity, I quickly began to learn that a part of Grand Chapter is facing the changes you have to make in your own chapter. This biennium the fraternity recognized nineteen chapters as Rock Chapters. Even after raising the standards for this award in years past, this is the most chapters that have earned this designation. These chapters were awarded during the opening session of Grand Chapter, so many opportunities to exchange knowledge of chapter operations presented themselves during meal functions and other downtime. 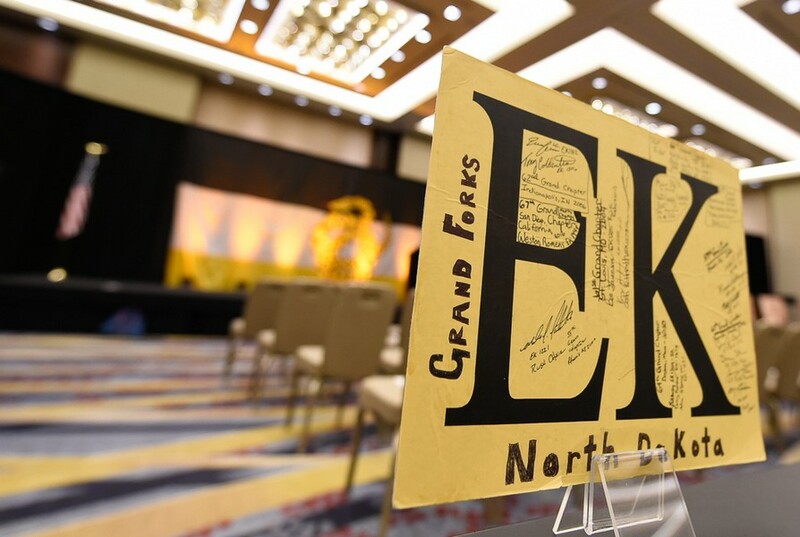 It's tradition for attendees to sign their chapter's convention floor placard and leave a note for those that follow. Along with talking to collegiate members about their chapters, I was also able to speak with alumni about their experiences in the Legion of Honor. I was able to reconnect with a very influential alumnus from my own chapter. We both had similar visions for the chapter and we both promised to stay in contact with each other. Collegiate members are capable of accomplishing a lot, but a network of alumni can really accelerate the process and I’m excited to see the changes that will be made in my chapter personally. 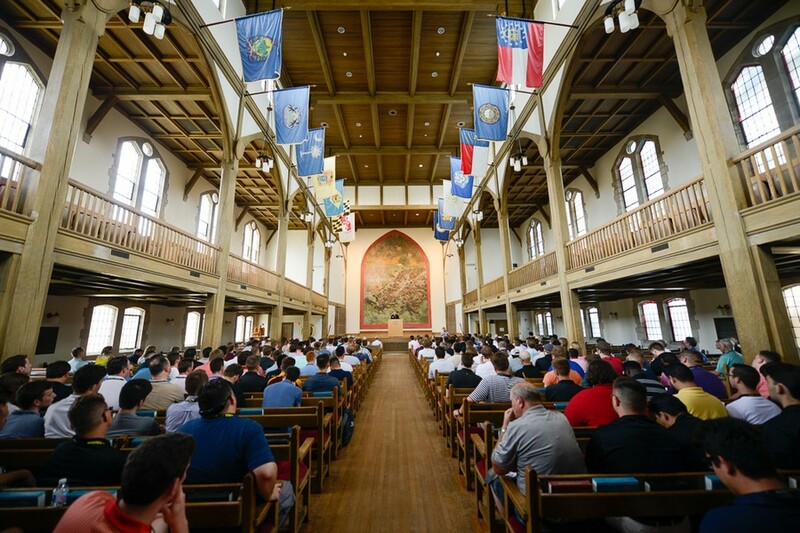 Attendees listen to the 68th Grand Chapter's Maddox Honor Lecturer, Colonel Keith Gibson, inside the VMI Chapel. Change was a common theme throughout the 68th Grand Chapter, but one thing that will never change is the impact of the men that wear our badge. 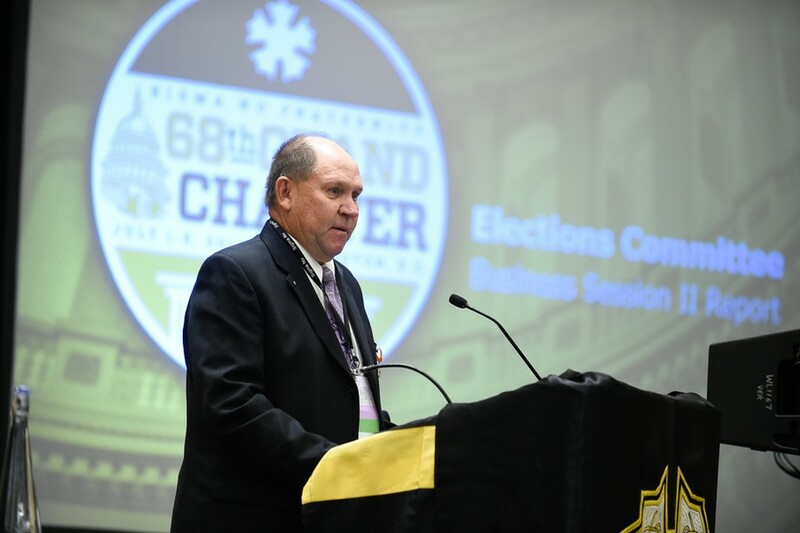 In the State of the Fraternity address, Past Regent Lee Perrett (Auburn) reported that during this biennium our members completed more than 375,000 hours of volunteer service and donated just over two million dollars for various charities around the world. Alumni members have also been working hard to keep the fraternity on top. Since 2005, the number of engaged alumni has risen from 647 to 2,166. An award ceremony was held to recognize exceptional work in the alumni community. Past Regent Dan Rodriguez (Arizona) and Charles Cook (Georgia/Jacksonville) were inducted into Sigma Nu’s Hall of Honor. 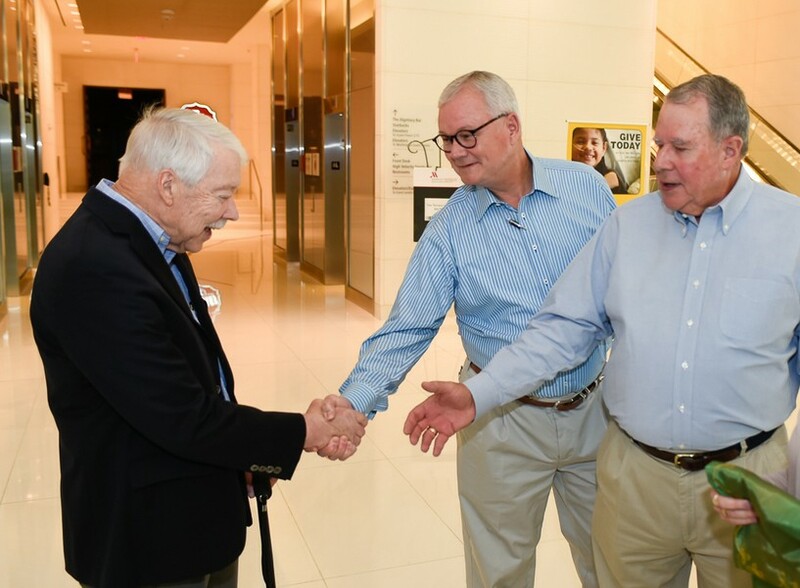 Burns Hargis (Oklahoma State), Warren Miller (Southern California), Les Muma (South Florida), Tom Shannon (Florida), William Stanfill (Georgia), and Wallace Stegner (Utah) were welcomed into the Sigma Nu Hall of Fame. Past Regent Perrett truly spoke to the moment by stating that we “are standing on the shoulders of giants,” encouraging collegians to learn from alumni experiences throughout life and take inspiration from them. 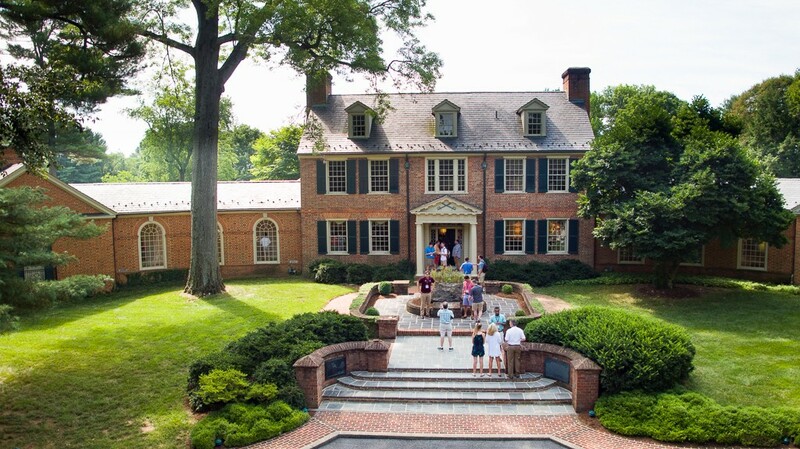 The special pilgrimage to Lexington, Va. begins with a visit to the Headquarters Shrine of Sigma Nu. Being a voting delegate at the 68th Grand Chapter of Sigma Nu was the most impactful experience that I have had thus far in my collegiate career. I am thankful for the beautiful hotel and all the staff that provided a welcoming experience for hundreds of Sigma Nu brothers. I am thankful that Grand Chapter was held in a historically rich city, like Washington D.C. And I am thankful to have been able to celebrate our nation’s founding in its capital. Regent Lee Perrett (Auburn) enters the convention floor on one of his final days as Sigma Nu's Regent. But the thing I am most thankful for is making the decision as a freshman to join such an impactful organization. Sigma Nu has made me the man that I am today. My experiences at the 68th Grand Chapter, the people that I met, and the knowledge that I now possess serves as a visual reminder that if you truly live your life upholding Sigma Nu’s values and governing each act by a high sense of honor, success in inevitable. 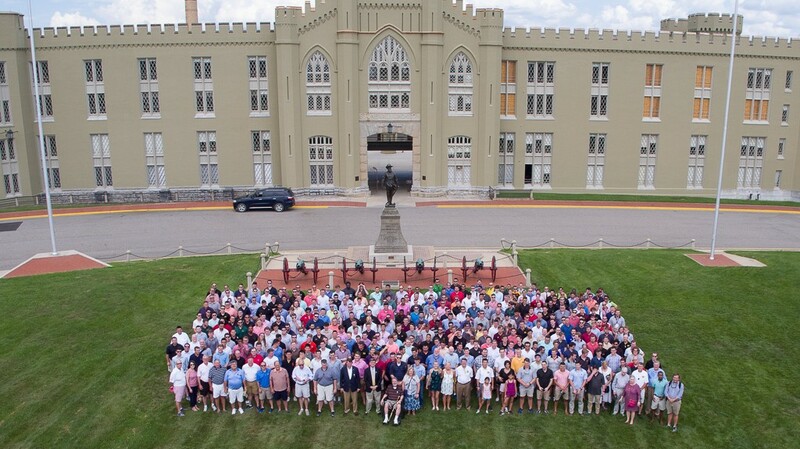 The 68th Grand Chapter pauses for a group photo on VMI's Parade Grounds, the birthplace of the Legion of Honor.